If you ever watched Reading Rainbow growing up, either in school or on your own, you probably remember the basic idea. 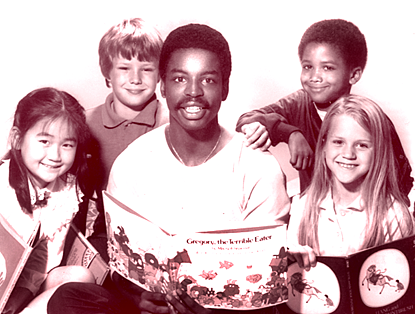 In each episode, the host, LeVar Burton, presents a children’s book. As an educational show, the first episode, which aired in 1983, isn’t a pilot in the typical sense; it doesn’t need to introduce characters or a story, just a format. But if think back to your childhood (depending on your age) you might wonder what book was the first that LeVar shared with us. That book was Tight Times by Barbara Shook Hazen, with pictures by Trina Sharp Hayman. Before introducing the book, however, the show starts on location, exploring a particular theme. The theme, in this case, is pets. At last the book is introduced, and it’s read by a young boy, fitting the first person voice of the story’s protagonist. The young hero describes his family’s experience with “tight times,” when the economy is bad and money is scarce. The family must make sacrifices, which means the little boy can’t have the dog he so badly desires. It’s a nice choice for a first book, since it centers on a child coming to grips with adult problems. Twenty-eight years on, it’s a reminder of how history repeats itself. That kid, were he real, would probably be explaining to his son right now why Santa’s sleigh will be a little lighter this year. This entry was posted in 1980s and tagged 1980s, big bang theory, books, community, educational, levar burton, memes, reading rainbow by meekthegeek. Bookmark the permalink.